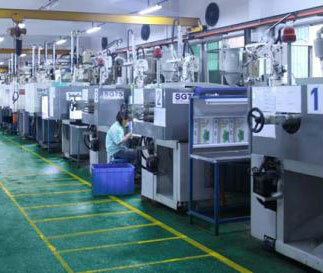 Mold injection molding is a processing method that is used when mass producing certain complex parts. The specific principle refers to the plastic material that is heated and melted is injected into the mold cavity of a plastic mold by a high-pressure screw of an injection molding machine and after being cooled and solidified, a plastic molded product is obtained. The plastic mold is composed of two parts: a movable mold and a fixed mold. The movable mold is mounted on a moving mold of an injection molding machine, and the fixed mold is mounted on a fixed mold of an injection molding machine. During the injection molding, the movable mold and the fixed mold are closed to form a casting system and a cavity. When the mold is opened, the movable mold and the fixed mold are separated to remove the plastic product. Although the structure of the plastic mold may vary due to the variety and performance of the plastic, the shape and structure of the plastic product, and the type of the injection machine, the basic structure is the same. Mainly by pouring system, temperature control system, forming parts system, exhaust system, guide system, ejector system and other components. The gating system and the molded parts are in direct contact with the plastic and change with the plastics and products. They are the most complex and most varied parts of the mold and require the highest finish and accuracy of the part. It refers to the part of the flow path before the plastic enters the cavity from the nozzle, including the main flow path, the cold material hole, the runner, and the gate. It refers to the combination of various parts that make up the shape of the product, including moving molds, fixed molds and cavities (concave dies), cores (punch dies), and forming rods. The core forms the inner surface of the article and the cavity (die) forms the outer surface of the article. After mold clamping, the core and cavity form the mold cavity. According to the process and manufacturing requirements, sometimes the core and the die are assembled from several pieces, sometimes made in one piece, and the inserts are only used in parts that are easily damaged and difficult to machine. 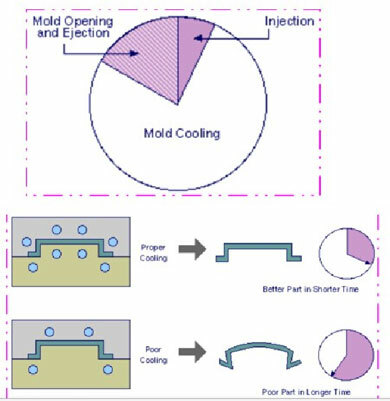 In order to meet the mold temperature requirements of the injection process, a temperature control system is required to adjust the temperature of the mold. For injection molds for thermoplastics, the cooling system is primarily designed to cool the mold (it is also possible to heat the mold). A common method for mold cooling is to open a cooling water passage in the mold and use the circulating cooling water to take away the heat of the mold. In addition to heating the mold, hot water or hot oil can be used for cooling, and the mold can also be installed inside and around the mold electric heating element. The purpose is to eliminate the gas generated by melting of air and plastic in the injection molding process outside the mold. 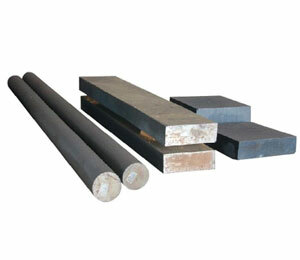 When the exhaust gas is not smooth, gas marks, scorching, and other defects will form on the surface of the product. The gas system is usually a slot-shaped gas outlet opening in the mold for discharging the gas from the existing cavity air and the melt. 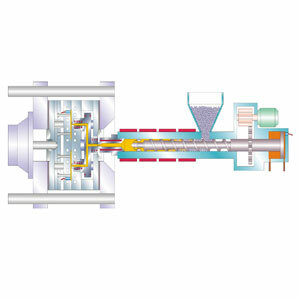 When the molten material is injected into the cavity, the air originally stored in the cavity and the gas brought in by the melt must be discharged from the mold through the exhaust port at the end of the stream. Otherwise, the product will have air holes, poor connection, and the like. Dissatisfaction with mold filling, even the accumulation of air due to the compression generated high temperatures and burn the product. Under normal circumstances, the vent hole can be located either at the end of the melt flow in the cavity or on the parting surface of the mold. The latter is a shallow groove that is 0.03-0.2mm deep and 1.5-6mm wide at the side of the die. During the injection, the exhaust hole will not leak much-molten material, because the molten material will cool down at this place and solidify the channel. The position of the exhaust port must not be facing the operator to prevent accidental ejection of molten material. In addition, the clearance between the ejector rod and the ejector hole, the clearance between the ejector plate and the ejector plate and the core, and the like can also be used for exhaust. It is to ensure that the movable and fixed molds can be accurately centered when the mold is closed, and guides must be provided in the mold. In the injection mold, four sets of guide columns and guide bushes are usually used to form the guide parts. Sometimes it is necessary to set the inner and outer taper surfaces that are matched with each other on the movable mold and the fixed mold to assist positioning. Generally include thimble, front and rear thimble plate, thimble guide rod, thimble return spring, thimble plate locking screws and other parts. After the product is molded and cooled in the mold, the mold is separated and opened in the front and back molds. The ejecting mechanism—the ejector pin pushes the plastic product and its aggregate in the flow channel out of the mold opening and flow channel position under the push of the ejector pin of the injection molding machine. For the next injection molding work cycle. The plastic mold according to the structure. Generally by the mold frame, mold kernel, auxiliary parts, auxiliary systems, auxiliary settings, dead-end processing agencies and other parts. Generally by the mold frame, mold kernel, auxiliary parts, auxiliary systems, auxiliary settings, dead-end processing agencies and other parts. Generally, do not need our design, can be ordered directly from the standard mold frame manufacturers, greatly saving the time needed to design the mold, so it is called a standard plastic mold. It constitutes the most basic part of the plastic mold. The mold part is the core part of the plastic mold. It is the most important part of the mold. The forming part of the plastic product is inside the mold, and most of the processing time is also spent on the mold. However, compared to some relatively simple molds, it does not have a mold part and the product is formed directly on the template. Most of the early plastic molds were relatively backward. Plastic mold commonly used auxiliary parts include positioning ring, nozzle bushing, ejector pin, grabbing the pin, support column, ejector guide bushing, rubbish nail, etc. They are part of standard parts and can be directly ordered When ordering together, there is also a part that needs to be designed. There are four auxiliary systems for plastic molds: gating systems, ejector systems, cooling systems, and exhaust systems. Sometimes, because the plastic material used needs to be heated at a high temperature, some molds will also have a heating system. The plastic mold is provided with eyelet holes, KO holes (top stick holes), and the like. When the plastic product has dead ends, the mold also has one or more structures that handle dead ends. Such as the slider, inclined roof, hydraulic cylinders and so on. In most domestic books, this kind of organization dealing with dead ends is called "Large Core Mechanism." In fact, the plastic mold is not difficult, regardless of how the plastic product changes, for the mold to form this plastic product, its structure is nothing more than the above aspects. The difference between molds is whether the molds are large or small. The positions or methods of the individual parts, auxiliary installations, and auxiliary systems are different. The method, structure, and size of dealing with dead ends have changed. Of course, the design experience is particularly important to make the designed molds simple to process, easy to assemble, long-lived, moderately priced and well-formed. A good experience can deal with the problems that arise in design and processing, and it is also more certain to treat changes. A general-purpose injection machine mainly includes an injection device, a mold clamping device, a hydraulic transmission system, and an electric control system. The main function of the injection device is to uniformly plasticize the plastic and inject a certain amount of melt into the cavity of the mold with sufficient pressure and speed. The injection device is mainly composed of a plasticizing part (composed of a screw, a barrel, and a nozzle) and a hopper, a transmission device, a metering device, an injection and a moving cylinder, and the like. Its role is to achieve the opening and closing of the mold, in the injection molding to ensure that the mold is tightly closed, and out of the product, the mold clamping device is mainly from before and after the fixed template, moving the template, connecting the template before and after the tie rod, clamping cylinder, connecting rod mechanism , mold adjustment device and product ejection device and other components. Its role is to ensure that the injection machine accurately and effectively works according to the predetermined requirements (pressure, speed, temperature, time) and sequence of operations. The hydraulic system of the injection machine is mainly composed of various hydraulic components and circuits and other ancillary equipment. The electric control system is mainly composed of various electric appliances and instruments. The hydraulic system and the electric system are organically organized to provide power and realize the injection machine. control.